On sale here is everything you would want in a power amplifier- unstoppable power, high current delivery that gives absolute control over loudspeaker of any impedance. Yet with these humongous power delivery is a musicality that will beguile you into listening for hours on end, stirring you to listen to CDs or records one after another, discovering hidden nuances you never knew your CDs or vinyls had. Such is the prowess of this awe-inspiring but gentle beast of an amplifier. When driving small bookshelf speakers, they transform into larger sounding speakers, wider sound-staging & depth with bass to die for. Krell amplifiers make bookshelves to "grow up" literally - floor stand speakers powered by Krell will perform full spectrum as befits the full-range specifications. 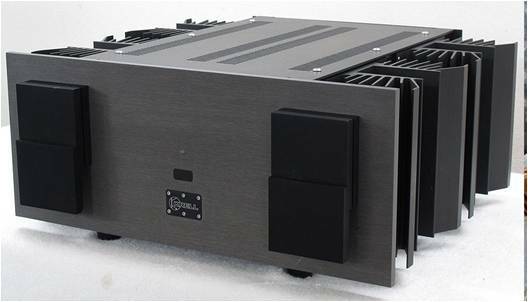 The Krell KSA-150 is full a Class A power amp, built to deliver power of 150 watts into 8 ohms per channel, doubling with every half of the impedance to 300 watts into 4 ohms, and exceeding 600 watts into 2 ohms & below. Most amplifiers would have folded up or blow a fuse driving into such notoriously low impedance. Call George for auditioning at 012-2955266 or Greg 011-39300083 at our Shop this weekend only at Amcorp Mall, Petaling Jaya.